Despite being busy with my heavy workload, as well as having been rather preoccupied with my acquisition of several other merchandise, I’ve managed to find the time and inspiration to complete yet another awesome Indiana Jones figure, albeit met with several delays. Living in the deep jungles of Peru, the Hovitos warriors, descending from the ancient Chachapoyan tribe, ferociously defended their ancestors’ temples from uninvited treasure hunters and tomb raiders. In 1936, when Indiana Jones arrived in Peru in search of a golden Chachapoyan fertility idol, the Hovitos allied themselves with the rogue archaeologist René Belloq, who had warned them about Indy. 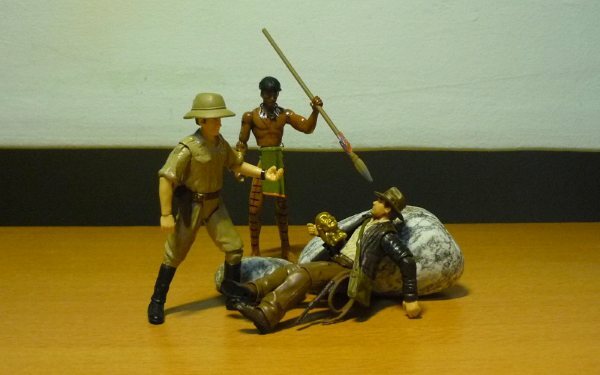 But when the Hovitos confronted and chased after Indy, Belloq made his getaway, taking the golden idol with him. 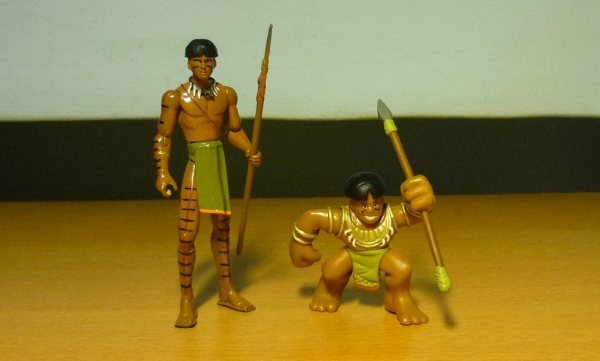 The Hovitos Warrior is among one of the few Indiana Jones characters that has his likeness made in the form of the Indiana Jones Adventure Heroes, but not as a 3.75″ figure. Therefore, I decided to gather together the parts to create this figure. The sandal straps on the legs needed to be dremeled off. The right lower arm was transplanted over, replacing the original Anakin Skywalker artificial right hand. A gold bangle was sculpted using epoxy to hide the seam where the arms are attached. Epoxy was also used to sculpt a bit of the hair to better resemble that of the Hovitos. The loincloth was attached at the waist. The necklace was created by pasting pieces of paper onto the whistle string. 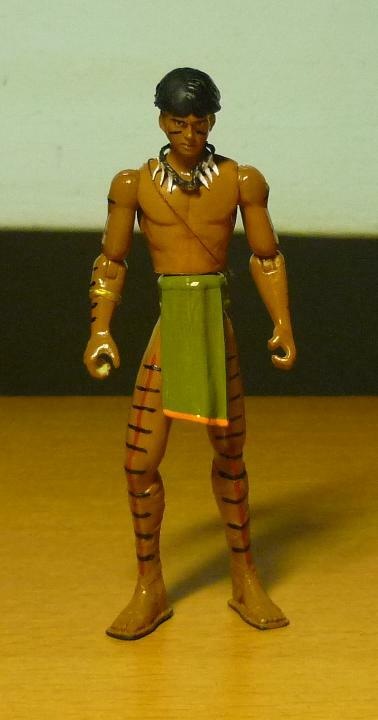 And the markings on the arms and legs were painted as they appeared on one of the Hovitos in the movie. As an added bonus, I had bought the Jake Sully figure (“Avatar”) so as to provide the Hovitos Warrior with his very own spear. 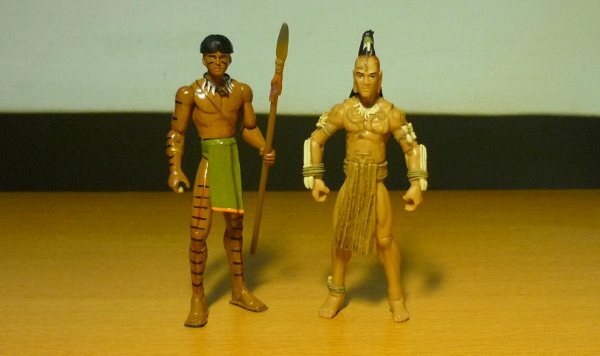 The Hovitos Warrior (left) and his cousin the Ugha Warrior (right). The Hovitos is somewhat taller than most other Indy figures as the Cairo Swordsman’s legs were rather long.